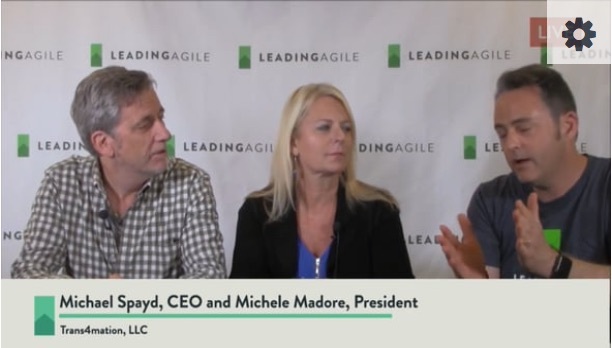 Michael Spayd and Michele Madore stopped by to chat about their new company Trans4mation which focuses on helping executive leadership migrate from a traditional way of leading/working into an approach that is more deeply rooted in Agile. You can learn more about the work Michael and Michele are doing by going to Trans4mation.coach, or by reaching out to them using the information below. 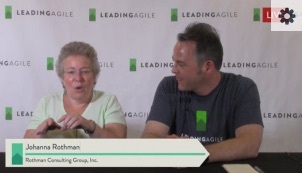 Johanna Rothman stopped by the LeadingAgile Podcasting Room during Agile 2016 to talk with about her conference sessions: Growing Servant Leadership and Agile Program Management. Getting to chat with Johanna is always one of the highlights of the Agile Conference. You can learn more about her on her website. Or pick up her new book Agile and Lean Program Management. Johanna is also participating in some of PMI's Building the Hybrid the PMO Workshops. Woody Zuill was at Agile 2016 to provide an update on The State of No Estimates. He also sat in the hot seat to take questions from the crowd during a Stalwarts session. Woody is the creator of No Estimates and Mob Programming. He is a very inspiring thought leader in the Agile space. 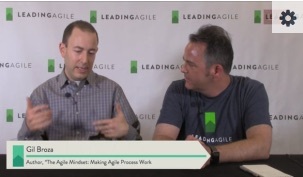 Listen in as Dave and Woody discuss his Agile 2016 sessions and upcoming public events. From there, Woody shares some practical questions about how No Estimates actually works and why it can be valuable. To learn more about Woody, where he will be speaking or the work he is doing, check out his website. You also can follow him on Twitter, or pick up his new book Mob Programming. The illustrations in his book were done by his wife Andrea, who also has a new book out titled, Wolf Camp. To hear a longer, more in depth interview with Woody that covers his background and how folk music led him towards software, you can find that here. My Agile 2016 interview with Gil Broza about his session, "How to Get Your Whole Team Talking". Gil's session offered participants a variety of experiences to help them feel safe interacting with one another in meetings. He also provided several thinking tools to support the development of strong communication. 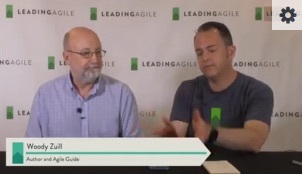 Dave and Gil discuss his session, additional techniques for running effective meetings as well as Gil's most recent book, The Agile Mindset. To get in touch with Gil, you can reach him on his website 3pVantage, or via Twitter @gilbroza. When I joined LeadingAgile a little over a year ago, one of the things that tipped the scale for me was the approach that Mike Cottmeyer had come up with for approaching Agile Transformation. Rather than the standard "we take you from the sucky misery you wallow in now to a magical land of agile wonderment", Mike's approach - with the compass and the basecamps, allows the organization to take small steps along the journey, transforming in stages. It also allows you to stop along the way if/when that makes business sense. This might be implied in the approach other organization's take (I'm sure they'll say it is if you ask them), but I was/am a big fan of the way it is articulated by my co-workers at LeadingAgile. And last week, at Agile 2016, Mike gave a presentation on "An Executive’s Step-by-Step Guide to Leading Large-Scale Agile Transformation" to over 400 people. I had the chance to sit down with Mike and interview him after his session. If you'd like to see the slides from his session, you can find them here. And if you'd like to see any of the other video interviews from last week, you can find them here. On the Digital PM Slack channel there was some discussion recently about Project Managers' having PTSD. In this podcast, Carson Pierce, Senior PM at DDB Edmonton; Registered Psychologist, Dr. Krista Pierce (who is also Caron's wife); and I got the chance to discuss the topic of Post Traumatic Stress Disorder, the stress PMs' experience at work and the relationship between the two.